Actor Grant Neale has performed in more than 200 plays, operas and films throughout the United States and abroad. He made his opera debut in The Santa Fe Opera’s critically acclaimed revival of Emmerich Kalman’s GRAFIN MARITZA playing Penizek, a role which he reprised with LA Opera and again in Santa Fe. Since then, his facility with language (performing in English, French, and German) and his physical virtuosity have made him a favorite with many of America’s premiere opera companies. He has played Frosch in 10 productions of Strauss DIE FLEDERMAUS (including Seattle Opera directed by Linda Brovsky, San Francisco Opera, Opera Company of Philadelphia, Opera Madison directed by Peter Kazaras, Yale Opera, Michigan Opera Theater, Virginia Opera directed by Dorothy Danner, Arizona Opera, and Dallas Opera directed by Tomer Zvulun), The Old Prisoner in Offenbach LA PERICHOLE for Opera Company of Philadelphia, Pastolle MARIE GALANTE by Kurt Weill for Opera Francais de New York, and most recently Lillas Pastia in The Santa Fe Opera production of CARMEN directed by Stephen Lawless. His repertoire also includes the Haushofmeister in ARIADNE AUF NAXOS, and Njegus in THE MERRY WIDOW. Grant is a former resident actor with both New York City’s acclaimed Jean Cocteau Repertory, and the legendary Ridiculous Theatrical Company. 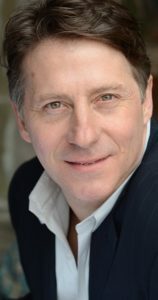 Some of his favorite theatrical roles have been Lech in Georg Osterman’s Brother Truckers (NYC, London, Edinburgh), Leontes in The Winter’s Tale (Milwaukee Shakespeare), the title-role Scapin (New York Classical), Ceausescu in Waxing West by Saviana Stanescu (NYC, Bucharest, Stockholm), Johnny in Frankie and Johnny in The Claire de Lune (Shaker Bridge Theatre, NH), Roman Polanski in Polanski Polanski (NYC, Romania tour, nominated for Outstanding Solo Performance NY Innovative Theater Awards). He received a Best Actor in a short film award at the Chain Film Festival 2015 for his role as Father Joe in the Christian LaMorte film Bless Me.